Baked Vanilla Oatmeal and Nutmeg - a great breakfast option, especially when the weather is cold and your body is craving those hearty, healthy foods! 2. Lightly coat a 2-quart baking dish with spray. 3. 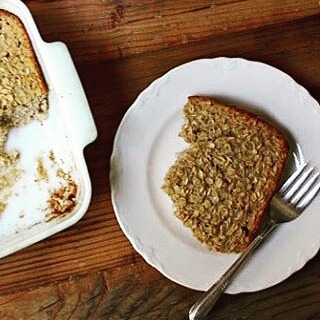 Combine oats, baking powder, nutmeg, and salt in a medium bowl; mix well. Set aside. 4. Combine almond milk, extract, eggs, applesauce, and honey in a large bowl; whisk to blend. 5. Add oat mixture to milk mixture; mix well. 6. Pour mixture into prepared baking dish. 7. Bake for 35 to 40 minutes, or until top has browned.